In a quest to understand and explain how climate change is affecting Colorado, I rummaged research journals and contacted scientists to delve into the impacts that are already happening and what a carbon-loaded future may look like in the state. Nine signs that Colorado’s environment is heating up. A high-country freezer-box of a former Colorado mining village, Gothic in winter doesn’t inspire thoughts of global warming. For eight decades, the busted-town site has been the home of the Rocky Mountain Biological Laboratory (RMBL, pronounced “rumble”), an independent, outdoor-research campus. Bustling with scientists and students from around the world during summers, the lab has served as the backdrop for scores of ecological and biological breakthroughs because of its pristine setting — surrounded by public land and eight miles from Crested Butte, up a windy highway and dirt road. But, in the winter, beneath heavy snows and bone-shivering low temperatures, RMBL shuts down. Billy Barr, the lab’s business manager, has endured winter in Gothic since 1972, a lone cold-season resident who maintains his office and helps with caretaker duties. At night, he watches movies and then posts quirky reviews online. This winter, Barr says, Gothic has felt particularly cold. It’s one of the snowiest in over three decades, with the ground buried by more than six feet. During the first full week of February, the temperature never rose above freezing, and the average high was just nineteen degrees Fahrenheit. Warming probably sounds like a cozy idea. But only one day this winter has set a new record-low temperature, while six new record highs have occurred on warmer days — hints of climate change and its complexities. Barr has maintained his own records, observing early signs of spring and the first stirrings of wildlife each year. Yellow-bellied marmots emerge from hibernation with the onset of spring — or at least they used to. The fat and furry critters, sometimes known as whistlepigs or rockchucks, now appear 38 days earlier than they did a quarter-century ago. Scientists believe the earlier emergence is tied to warmer spring temperatures, even though the ground is often still covered with snow, leaving the marmots scrambling for food and perilously vulnerable to coyotes. Places set aside for ecological preservation, including RMBL and Rocky Mountain National Park, offer opportunities to key into such changes, some of which are occurring on a scale that the region and the planet haven’t experienced in thousands of years. “This state is enormously complicated climatically,” says Brad Udall, who runs the Western Water Assessment at the University of Colorado at Boulder. “It probably has more microclimates than any other state” because of the range of our topography and the convergence of the Great Plains, the Rocky Mountains and the high desert of the Colorado Plateau. This climatic complication means that Colorado has actually had it comparatively easy so far in terms of warming. According to data from the U.S. Historical Climate Network, compiled by the Colorado College State of the Rockies project, the state has warmed an average of 0.39 degrees Celsius in the last half-century, while most other Western states have heated by more than half a degree. the West are muted,” says Jill Baron, of the Natural Resource Ecology Lab at Colorado State University, who has studied climate change trends within Rocky Mountain National Park. But we’re not getting away with anything. Models predict Colorado in 2085 will be seven to nine degrees (Celsius) hotter in summer and five to six degrees warmer in winter. Snowpack, our main source of water, is predicted to drop to half of the current average. Warming will have advantages around Colorado, causing longer growing seasons, wider stretches of some wildlife habitat, and possibly more precipitation in some regions. But signs of stress are already all over the state, and unless we rapidly alter our carbon-dioxide emissions — and encourage China and India to do the same — climate change will trigger even greater chaos on our landscapes and in our lives. Located in the south end of the Indian Peaks Wilderness, Arapaho Glacier is protected as a drinking-water source for the city of Boulder. 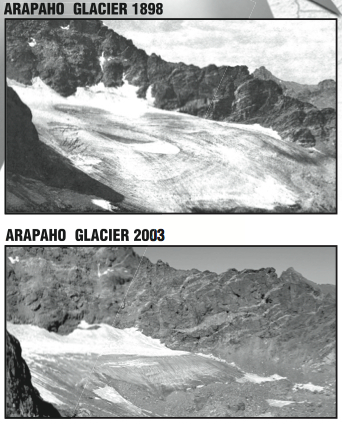 Arapaho is the largest glacier in Colorado, and it’s shrinking fast. The glacier has thinned by roughly 120 feet since scientists started taking measurements in 1960. Archival images from 1898 show Arapaho had retreated significantly between then and 1960. Glacial melt in Colorado — as in Glacier National Park in Montana, on the flanks of Mount Kilimanjaro in Africa, and along the Greenland Ice Sheet — is directly tied to global warming. But Arapaho’s transformation is something of an anomaly in the state. Glaciers around the park are fed by drifts, winds and avalanches that pack them with ice and snow, and Fountain figures that climate conditions haven’t changed enough to affect them yet. Still, his team, taking the first measurements of the park’s ice fields since the 1970s, has concluded that the glacierets began retreating over the last decade, and there are additional signs that significant transformations are afoot. A melting Front Range glacier revealed bison remains that researchers dated at two thousand years old. The preserved state of the remains suggests they haven’t been exposed much since their burial, an indicator that warming is occurring on a scale not seen in millennia. What to Expect in the Future? The retreat of the little glaciers could be a harbinger of warming temperatures affecting our landscape on a more local scale. “It looks like we’ve reached a tipping point,” Fountain says of the changes, “but it’s one of those things that we don’t know until we’re past it.” In other words, until it’s too late. snow persist as banks of moisture for plants and wildlife during the hottest and driest times — when life needs water the most. The decline of our glaciers could leave rare, alpine critters and vegetation high and dry. makes, what birders consider, a distinctive, soft “hoo-ee” call. Generally found among grassland areas, the good news is that Colorado probably won’t need to look for a new state bird anytime soon. Because of Colorado’s range of elevations, bird species that reside in or migrate through the state should be able to endure climate change by taking wing northward through the state or upward in elevation to find cooler or wetter habitats that suit them. The geography and birds’ mobility have prevented noticeable changes in migrations, breeding patterns or populations in the state, says Jeff Price, author of a national report on global warming and songbirds for the American Bird Conservancy and the National Wildlife Federation. One possible indicator of change comes from Billy Barr’s observations at RMBL. American robins now arrive in the high country of Gothic two weeks earlier than they did in 1981 and then spend roughly eighteen days scrounging for food until the ground is bare. Price, formerly of Boulder and now at California State University, Chico, says the example isn’t ideal, because robins are resident birds, not migrating into the state. Still, the data implies that the birds are following temperature cues to move to higher elevations, even though there isn’t a food source. Robins may be able to improvise over time, but migratory species in need of food to complete their cross-continent journeys, or species with more specialized habitat requirements, are more susceptible. In other cases, some birds that typically head south for the winter are now more likely to stay in the warming climes of Colorado. Colorado’s premier ski resorts — Wolf Creek, Vail and Steamboat Springs — receive nearly 350 inches of snowfall a year on average, earning the state its world-class reputation. Resort managers can’t control when that snow falls, which is why they spend lots of money artificially augmenting the snowpack, creating powder from hoses. It’s obvious what’s at stake for the resorts, and the state, if climate change tweaks the winter weather. David Clow, of the U.S. Geological Survey, looks at data from 72 remote weather stations, monitored by the Natural Resources Conservation Service, that measure the air temperature, depth of snow and its water content throughout the state’s high country. Using radio telemetry, the network of gauges report those values each hour. With nearly thirty years of data, Clow has observed decreases in the total amount of winter precipitation in Colorado. And there are other signs of trouble. “The main trend we’ve seen is a shift in the time of snowmelt toward earlier in the year,” Clow says. Overall, snow in Colorado melts two weeks earlier than it did three decades ago, and there are corresponding shifts in the timing of spring runoff. The trends fit with regional patterns observed throughout the West. Another alarming region-wide shift with links to climate change: More winter precipitation now falls as rain instead of snow, particularly at lower elevations, which means less water flows into rivers in the spring to fill reservoirs. What to Expect in the Future? The earlier onset of spring means a more abrupt end to the ski season, but Colorado resorts could make out in the short term. So far, our state’s slopes have experienced milder changes than the mountains of the Pacific Northwest, the Northern Rockies and the Sierra Nevadas. With 37 summers’ worth of data, Inouye has recognized that many wildflowers are opening sooner in spring — another result of earlier snowmelt — when they are more susceptible to frosts. In his plots, Inouye has seen frost damage snuff out the flower buds of tall larkspur, a favorite of hummingbirds; fleabane daisy, the preferred nectar source of the Mormon Fritillary butterfly; and Aspen sunflowers, an important food for bumblebees. The consequences extend to other organisms, Inouye adds. Fly larvae feast on the sunflower seedheads, and parasite wasps eat the flies. So, a crash in wildflowers will have consequences for all of the high country’s biological diversity. “What’s happening with these plants are indicators that climate change is happening and happening quite rapidly,” Inouye says. What to Expect in the Future? If the trends continue, Inouye half jokes that Crested Butte might need to replace its title as the Wildflower Capital of Colorado. And while he is careful to note that climate fluctuations, like El Niño and the North Pacific Oscillation, play a role in the changes on the ground, he believes global warming is at work in the high country, and the long-term impacts are visible at RMBL. John Harte of the University of California at Berkeley has spent the last eighteen summers at the lab, conducting an experiment into the future. Using heat lamps, Harte melts the snow from a meadow three weeks earlier than nature does and then keeps the soil warmed an extra two degrees Celsius (four degrees Fahrenheit) — “conditions that Colorado will resemble in about thirty years,” Harte says. more sagebrush and fewer wildflowers. Warming beckons the uphill creep of sagebrush, drying out meadows and eliminating the cooler and wetter conditions for flowers and their pollinators. “The even more important result — but it’s not visible — is the loss of soil carbon,” Harte says, which creates a “positive feedback.” The shift of vegetation causes the ground to store less carbon, which is then released into the atmosphere as greenhouse gases, causing more warming. Perhaps Crested Butte will become the Sagebrush Capital. and temperatures of the river, trout cruised through the canyon’s cold waters and fed on flurries of insect hatches. Downstream from the canyon, native warm-water fish — Jurassic Park-looking beasts like the Colorado pikeminnow, the razorback sucker and the humpback chub — used to swim in the river’s warmer waters. Today, introduced trout proliferate below the dams, and the warm-water fish are listed as endangered species, facing extinction throughout the Colorado River system. The effects of dams and diversions on streams can provide us with a glimpse of the consequences of climate change, says David Merritt, a riparian ecologist with the Forest Service and the Natural Resource Ecology Lab at CSU, who studies stream flows and riparian (streamside) ecosystems in the West. By altering river flows and natural sediment movement along streams, dams affect not just fish but also cottonwood trees, willows and other riparian vegetation, which rely on flooding for regeneration and dependable low flows for maintenance. Instead, drought-tolerant vegetation, including invasive species like Russian olive and tamarisk, can thrive. Ironically, dams and diversions along the Front Range serve as a natural experiment, Merritt says, where we can look at scenarios of future climate change — like lower or earlier runoff and peak flows — to understand how river systems will respond to warming and decreased flows. What to Expect in the Future? The transformation of rivers from warming could lead to “terrestrialization,” Merritt says, meaning the encroachment of junipers, ponderosa pines and other flood-intolerant, upland vegetation into former wetlands and riparian areas. Considering that sixty percent of the state’s flora occurs within these areas and eighty percent of wildlife uses them at some stage in their life cycle, reduced stream flows could have noticeable negative effects — not to mention for people who siphon off those flows for cities and farms. As far as actual water in our rivers, the forecasts range widely. Some models show precipitation totals increasing in parts of the state, including the extension of monsoon conditions from the Southwest. On the other hand, there’s a chance that the desert of Arizona will spread north into Colorado as temperatures climb. Udall says projections for the Colorado River predict its flows will dry up between 5 and 50 percent over the next century. Even in the best-case scenario, Colorado — and the six other Western states that share water rights to the river — will have to get creative and cooperative with their water use, considering the astronomical population-growth trends for the region. Some water managers say the forecast supports storing more water behind new dams, like the proposed Glade Reservoir for the Cache la Poudre River outside Fort Collins. Other researchers say higher evaporation rates and the changes in flows should make the case to not build more dams. During her research at RMBL in summer 2002, Carol Boggs noticed a Gillette’s Checkerspot, an orange, black, and white butterfly, far from where the insects usually fluttered about. The butterfly species, although common in the West, had been introduced to the lab decades earlier by another scientist and maintained a small range with no more than 125 individuals. In the midst of a drought, Boggs, a Stanford University biology professor, realized the Checkerspot population had exploded, “by an order of magnitude,” to 3,000 individuals and expanded its range by half a mile. After statistical analysis, Boggs and colleagues believe warmer temperatures are most likely the critical factor triggering the Checkerspot boom. Boggs has also tracked the lab’s population of the Mormon Fritillary, another common Western meadow butterfly, for 10 years. She realized the species’ success relied on its nectar supply, which is closely tied to the timing of snowmelt. The earlier melt means that flowers bloom earlier, making them more susceptible to late-season frosts that kill the flowers. That leads to decreases in the Mormon Fritillaries, because they have less fuel to survive and reproduce. And since they help pollinate plants and crops, which then pump oxygen into the air for people to live on Earth, they’re pretty essential. The changes at RMBL — one minor and introduced species thrives, another native one declines — are an example of how climate change can shuffle the biological diversity of ecosystems and trigger other changes among the plants the insects pollinate or the birds that eat them. Among the perfect storms of the natural world, Colorado’s pine-beetle epidemic is pretty damn perfect. The combination of drought and reduced precipitation with dense forests of same-aged trees has created prime conditions for pine beetles to conquer lodgepole pine trees. The devastation of Summit and Grand counties is visible, and the beetles have crossed the Continental Divide to Front Range forests. Early symptoms of climate change favor the pine beetles in two ways. First, milder winters enable the beetle larvae to survive, says Jeff Hicke of the University of Idaho, who has modeled climate-change impacts on pine beetles. Second, warmer summers have likely sped up beetle lifecycles, from two years to one year, facilitating more outbreaks. What to Expect in the Future? Mountain pine beetles usually only attack lodgepole pines, but, as warming continues, the insects could jump to other species in Colorado forests. “Now we’re seeing lodgepole pine at very high elevations being attacked, which is unusual, if not unprecedented,” Hicke says. Like whitebark-pine trees in the northern Rockies, which are currently being attacked by the insects, limber pines and bristlecone pines could both host beetles, but neither may be adapted to them, like lodgepoles, Hicke adds, so they could suffer even more severe declines. Bristlecone pines, widespread around South Park, are the oldest trees in the state — thousands of years old — and some are as tall as 40 feet. Despite the possible devastation, increased carbon dioxide levels should boost tree growth for some species in some regions. We could see more stands of aspen trees emerge as pines die off and other changes in forest diversity that will create “new” ecosystems, distinct from the wooded landscapes we see now. Love forlorn, not global warming, could properly be blamed for the ignition of Colorado’s largest recorded wildfire. On June 8, 2002, Forest Service ranger Terry Barton burned a letter from her estranged husband inside a fire ring in the Pike National Forest, southwest of Denver. Arson may have been the cause, but extremely hot temperatures played a key role in the wildfire’s growth. The Hayman Fire, as it was named, was preceded by four days of 90-plus-degree (Fahrenheit) heat. On June 9, the blaze blew up and spread 60,000 acres, fed by wind gusts and a peak temperature of 95 degrees. It was the hottest June 9 in Colorado in 80 years. On the same day, another wildfire in the Durango area doubled in size in just 40 minutes and then expanded its area six-fold in only three hours. Before Hayman was finally contained, weeks later, it scorched 137,000 acres and destroyed 133 homes. In 2006, four scientists published the results of a survey of every large Western wildfire dating back to 1970. The conditions for big burns are often tied to a century of fire suppression. The researchers found another correlation. Starting in the mid-’80s, the number of wildfires spiked in the West. Through statistical analysis, the researchers recognized a strong association between fires and earlier snowmelt and higher spring and summer temperatures. Like other warming trends, the increase is strongest in the northern Rockies and Sierra Nevadas, but Colorado fires, including Hayman, have also responded to the elements. What to Expect in the Future? Hotter temperatures will mean drier and more fire-prone forests that burn hotter and wider than they would under past conditions. Climate change could also increase storms and their lightning strikes. And fires emit a lot of greenhouse gases, another positive feedback. Growing “exurban” communities of homes mixed among forests will add to the risks to life and property from more frequent and intense fires, too. Considering the federal fire-prevention budget already exceeds $1 billion a year, wildfires could also burn lots of money. Just as most residents and tourists shower their love and money on the Rockies, the plains of Eastern Colorado receive less attention from researchers. But the farms and ranches, and the surrounding grasslands, could experience some of the greatest changes from warming. For five years, Jack Morgan, of the U.S. Department of Agriculture, and his colleagues maintained chambers over grassland areas in Weld County, one of the driest parts of the state, and pumped them full of carbon dioxide, equivalent to levels projected for 2100. Fringed sage, a small woody shrub, thrived in the experimental plots. Already common among slightly deteriorated, or overgrazed, ranchlands, the plant isn’t very palatable for cattle. Morgan is now undertaking a similar experiment on the grasslands of southern Wyoming that will test how invasive weeds might do in a warmer and carbon-dioxide-enriched environment. What to Expect in the Future? The prairies of Eastern Colorado are expected to heat up more than any other region of the West, according to the Colorado College State of the Rockies project. Models are less clear on changes to regional rainfall: “For predictions of precipitation, you might as well flip a coin,” says CSU researcher Bill Parton, who has worked with Morgan. Parton says precipitation will likely be less consistent from year to year, meaning plants and crops that can handle variability will fare best. One study, by a CSU graduate student, showed that more rainfall variability increases plant productivity on Colorado’s dry plains (although the wetter grasslands of Kansas responded to the same experiment with decreased growth). Ranchers could gain some benefits, if winters are warm enough to allow cattle to forage on the range for longer periods. Extended growing seasons would be good news for farmers — and higher carbon-dioxide levels could increase plant production and reduce water loss. Parton says winter wheat crops could grow just fine under forecasted climatic shifts, but corn and other summer crops become less viable in hotter times. Farmers are already fending off growing Front Range cities that want their water. James Pritchett of CSU’s agricultural economics department says climate change could trigger a loss of groundwater if irrigation flows decrease or become less consistent, which could lead to more erosion on the plains. The U.S. National Assessment on Climate Change, completed in 2000, forecasts that Western farmers may have to increase crop diversity to roll with the changes. Orchards, like those on the Western Slope, will likely require expensive and difficult relocations as crop zones shift northward. Last year, the U.S. Postal Service released a “commemorative” collection of stamps in its “Nature in America” series, detailing the flora and fauna of the Colorado Rockies. The sheet of stamps features yellow-bellied marmots, white-tailed ptarmigans and several butterflies, as well as elk, bighorn sheep and golden eagles. With climate change in motion, the stamps are almost like an early eulogy for the natural environment of our state. In most cases, it’s nearly impossible to separate the effects of global warming from other climate variations and drought conditions. But the signs of change, on an unprecedented scale, are evident. Each of the cases highlighted above comes from peer-reviewed research, published in accredited journals of science. There are more, and there are also anecdotal observations that hint at the miniscule and massive changes occurring in our state and on our planet. Clearly, our greatest concern in Colorado and out West will be water resources, but global warming threatens to transform every aspect of our environment. Plants and wildlife respond to different cues to survive and reproduce. Wildflowers now bloom, only to be killed by frost. Birds migrate but find diminished food supplies and habitat. Marmots emerge and get picked off by coyotes. Each of these changes is called a “disjunction,” and they are signs of how climate change is jamming the circuits of our natural world in Colorado. In a few centuries, our progeny may only have stamps to remind them of the state we now know.